I’m in for my 10th Ludum Dare. I’m in for my 8th Ludum Dare! Libraries: Slick2d and JEngine(My Slick2D layer). Picture from LD31, nothing has changed except I’m using http://ludumdare.com/compo/2015/08/06/ludum-dare-33-wallpaper-2/ as a wallpaper and I have my laptop on top of my desktop if I need to use it for anything. I’m in for my 7th Ludum Dare! Picture from my last LD, nothing has changed except I’m using http://ludumdare.com/compo/2015/03/13/have-a-wallpaper/ as a wallpaper this time. In for my 6th Ludum Dare. Base code can be found here: https://github.com/JPatrickDev/LD31 Right now it is just an empty Intellij project with slick2d and lwjgl set up and JEngine included, probably won’t touch it again till the start. I’m in for my 5th ludum dare! 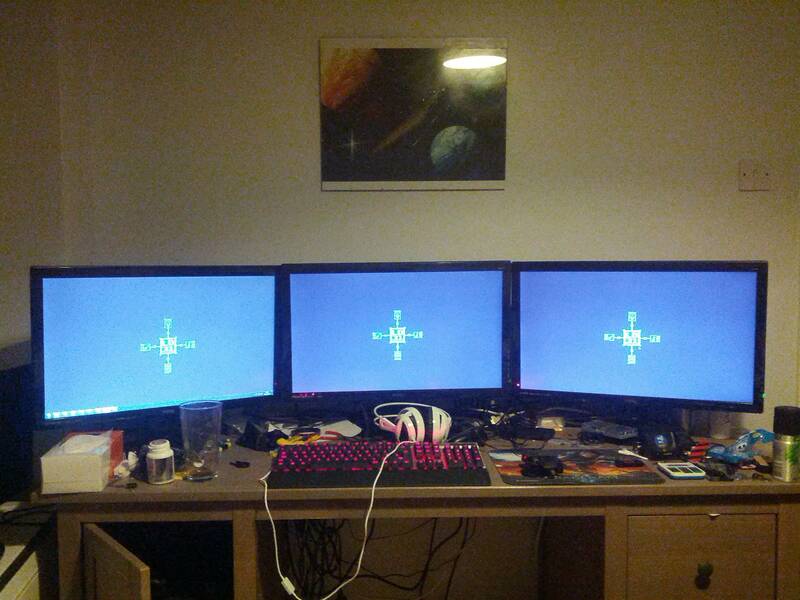 Will be doing most of the dev work on the far left screen, since it is the one I will be time lapsing. ^ Setup, same picture as my last “im in”. Hi guys I’m in for my 4th Ludum Dare. It should probably have a delay between each shoot…. 6 hours in, got collision detection working, but thats about it..
Just got up after 3 hours of sleep, and finished of the collision detection method I added last night. The theme is growing on me…. At first, I was not happy about the theme, but I have an idea that, while not be the most creative idea ever, I am fairly sure I can get done within the 2 days. Gl everyone! Hi guys in for my third Ludum dare. What a great weekend, thanks to the organizers, see you next time guys! The aim to is to go around killing as many people in 5 mins as you can. You can buy throwing stars, firebombs, swords and a bow. Will probably add more exploding stuff. Just got to make it so you can actually buy stuff, villagers contstatly spawn, 5 min timer, and a soldier mob that fights back, and goats, of course. As I stated early, I will be using JEngine, my base code, for my game.